(P) 2017 Edel Germany GmbH. earMUSIC is a project of Edel. ℗ 2012 Thompson Music Pty Ltd, exclusively licensed to Eagle Rock Entertainment Ltd.
Edel Germany GmbH. earMUSIC is a project of Edel. (P) 2015 Edel Germany GmbH. earMUSIC is a project of Edel. (P) 2013 Edel Germany GmbH. earMUSIC is a project of Edel. 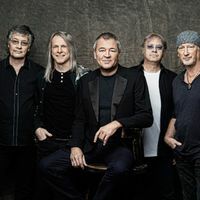 Deep Purple (Overseas) Ltd. under exclusive Edel Germany GmbH. earMUSIC is a project of Edel. Deep Purple (Overseas) Limited Edel Germany GmbH. earMUSIC is a project of Edel.